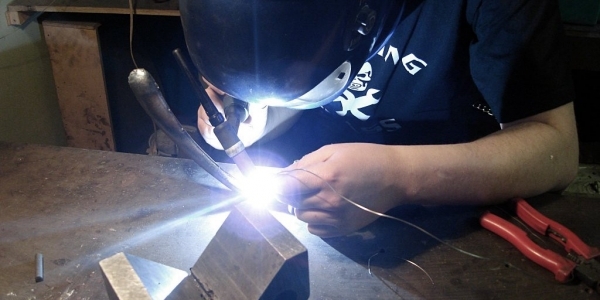 Jump into the world of metal sculpture and welding with this supportive class. Join us for our fun annual class in welding and small metal sculpture! Learn to use MIG welders and basic brazing techniques. We will use right angle grinders to cut and smooth metal and welds, and bend and shape metal using heat from MAPP gas torches. This is a great introductory course to the world of metal sculpture with a supportive, positive, and laid back atmosphere. Participants should wear long sleeves, long pants, heavy boots, and a bandana. Mark van Gulden, Music Director at ArtisTree, is a musician living in Barnard and working throughout the state and the Northeast. Specializing in vibraphone and percussion, Mark has a BFA in Music Performance and Composition from Johnson State College. He has worked in Vermont as a freelance musician for many years, playing concerts and club dates, and has been involved with multiple recording projects. Mark enjoys developing an exciting, vibrant, and accessible music program for the Upper Valley community. Ben Fox, LCMHC, ArtisTree Art Educator & Coordinator, is a local expressive arts therapist with a long and diverse history of art and trades experience. A stained glass artisan in his youth, Ben sought further arts education at RISD and the Pilchuck School of Glass. Ben has a Masters of Arts in Expressive Therapies and a B.A. in Studio Art from Hamilton College. He has taught and worked in various creative fields such as making outdoor clothing and bags, fine woodworking, photography, and lately outdoor sculpture.